This Newbery Award children’s book has a bit of everything in it, and more. Country kids meet city kids. Northern kids meet life in the South, circa 1963. A bullying brother still knows how to protect his little brother when needed. Sibling rivalry. Parental decisions. Delinquency. The ground this children’s book covers is astounding. And it all culminates in an actual world-shaking event, the bombing of a church in Birmingham in 1963. Whew! There’s lots of humor and plenty of well-written dialect in this children’s book – dialect that is so accurate you can almost hear the southern drawl coming off the page. It’s exceptionally well-written, and the parts that are uncomfortable are well balanced with tender, honest family caring. I also cheer for the successful way this book exposes children to a very true and important time in our history. 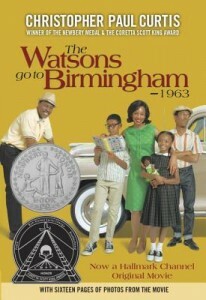 The book would be particularly fine for a classroom study on the civil rights movement. There are several classroom guides available. It would also be fun to listen to a good audio recording of this book, to really get the dialects. I understand the book was also made into a movie, but as always, I recommend reading the book first. For an author biography for children, check out Christopher Paul Curtis.